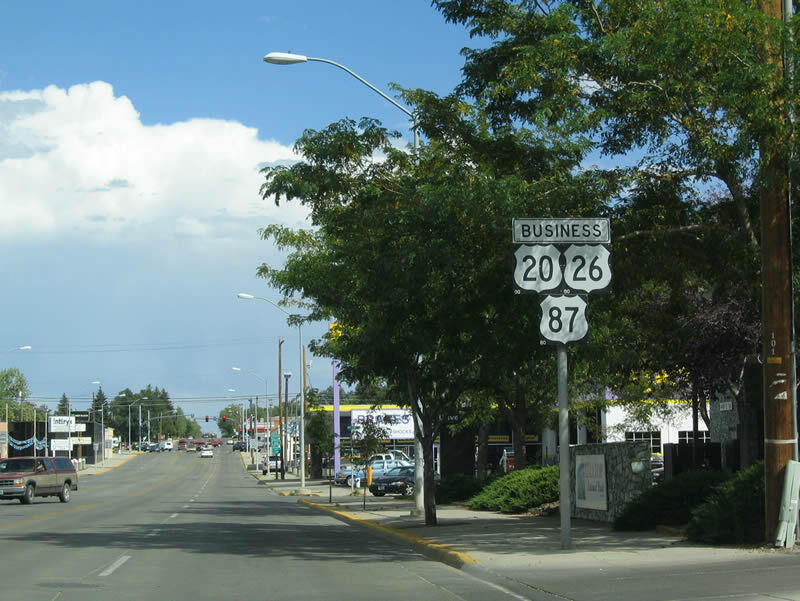 Business U.S. 20-26 follows West Yellowstone Highway, West First Street, and East Yellowstone Highway. 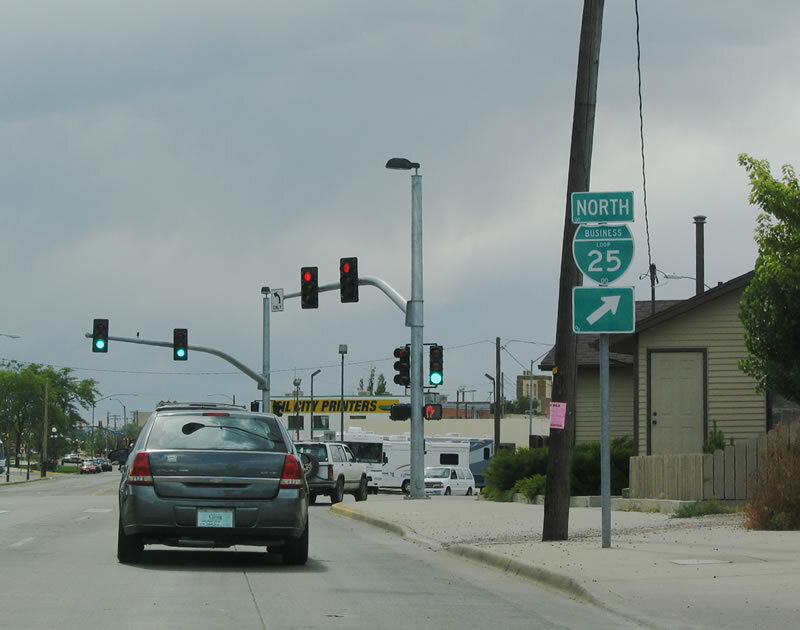 After the business route (West Yellowstone Highway) separates from the bypass route (U.S. 20-26) is this shield assembly indicating that Business U.S. 20-26 connects to Business Loop I-25, Business U.S. 87, and Wyoming 220 (via Wyoming 258). Photo taken by 09/01/04. 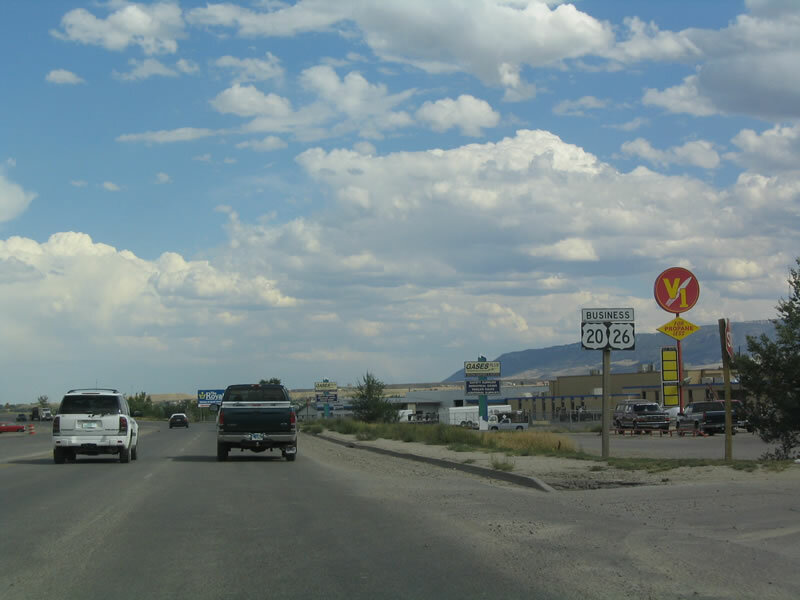 The old alignment of U.S. 20-26 is still known as Old Yellowstone Highway, and it is signed as Natrona County Route 127. From here, Natrona County Route 127 travels northwest via the Burlington Northern and Santa Fe Railroad. Business U.S. 20-26, meanwhile, continue east toward Mills and Casper. Photo taken by 09/01/04. 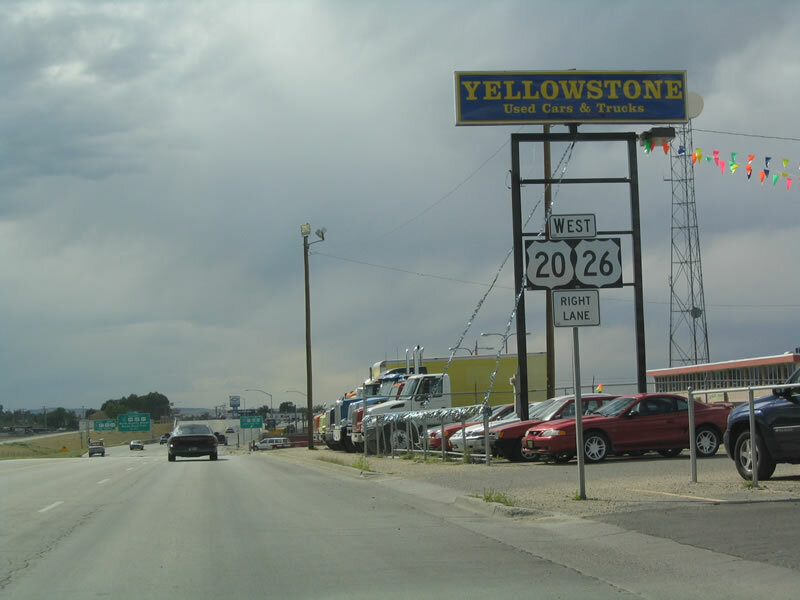 A trailblazer shield for Wyoming 220 is posted after the Old Yellowstone Highway intersection. Wyoming 220 travels southwest from Casper toward Muddy Gap via Alcova, Independence Rock, and Devils Gate. 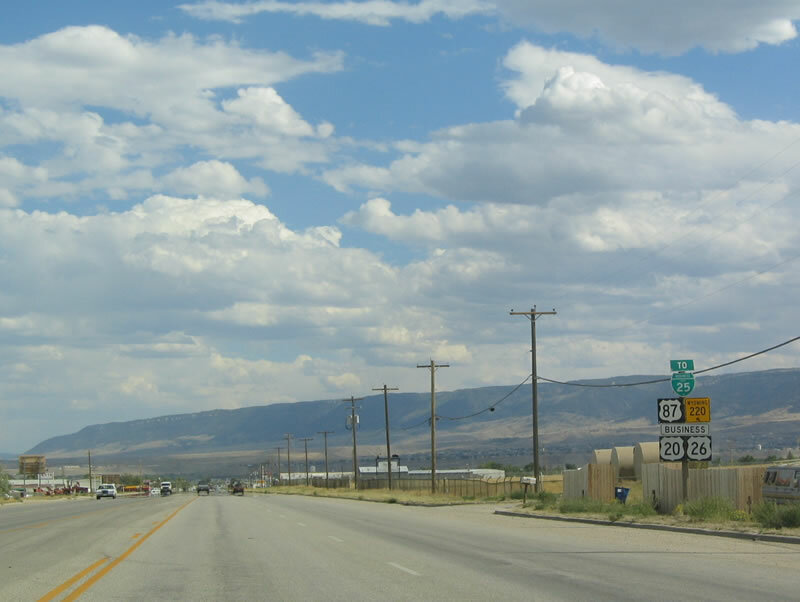 At Muddy Gap, travelers may turn northwest onto U.S. 287/Wyoming 789 toward Lander or turn south on U.S. 287/Wyoming 789 toward Rawlins and Interstate 80 (to Rock Springs, Evanston, and Salt Lake City). 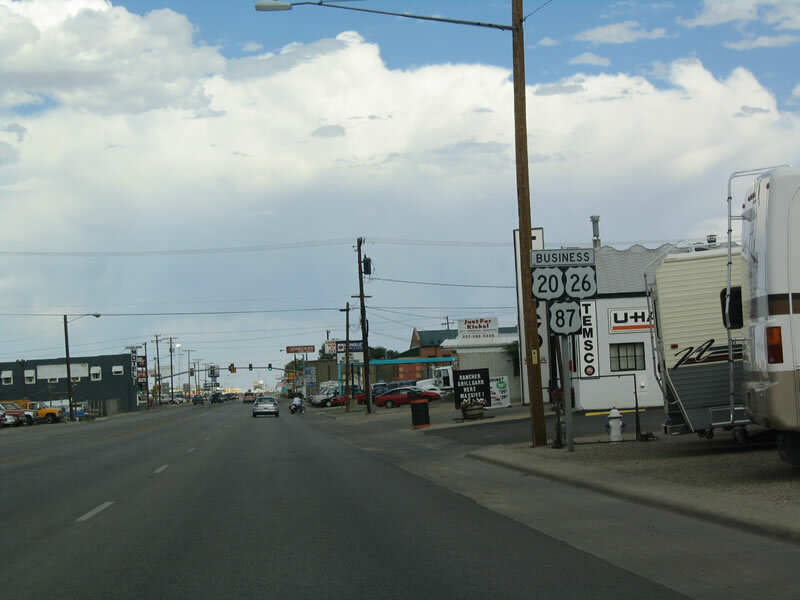 To Laramie, follow Wyoming 220 west to Wyoming 487 south to U.S. 30-287 southeast. This is a faster route than using the Interstate Highway System to Laramie. Photo taken by 09/01/04. 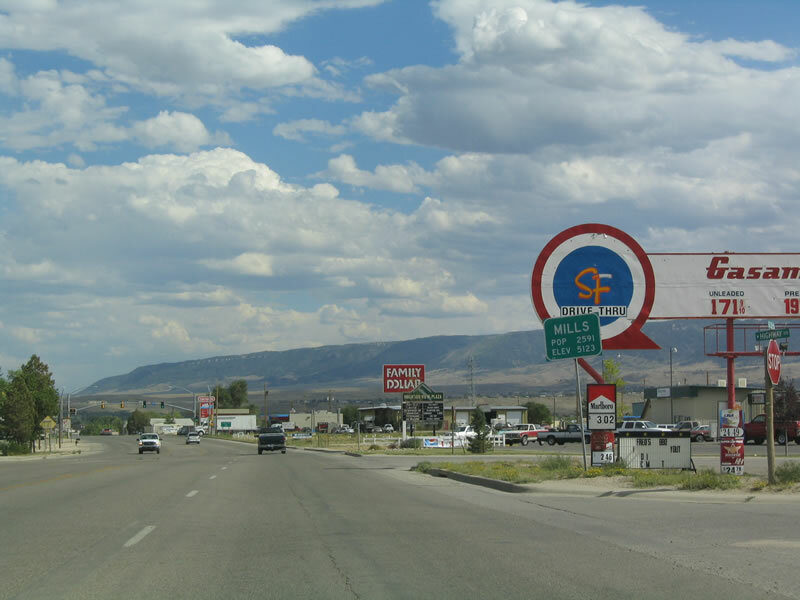 The town of Mills is a suburb of Casper, located just west of Casper and south of Bar Nunn, another suburb. Home to 2,591 people per the 2000 Census, Mills is a small community across the North Platte River from Casper. Photo taken by 09/01/04. 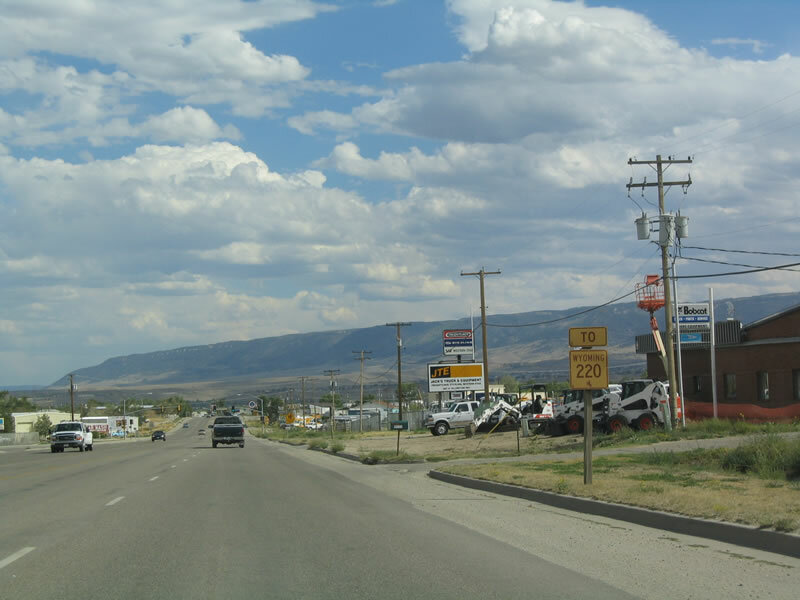 Passing through Mills, eastbound Business U.S. 20-26 (West Yellowstone Highway) approaches Wyoming 258, which serves as the circumferential highway around the western, southern, and eastern edges of the Casper metropolitan area via Wyoming Boulevard. Photo taken by 09/01/04. 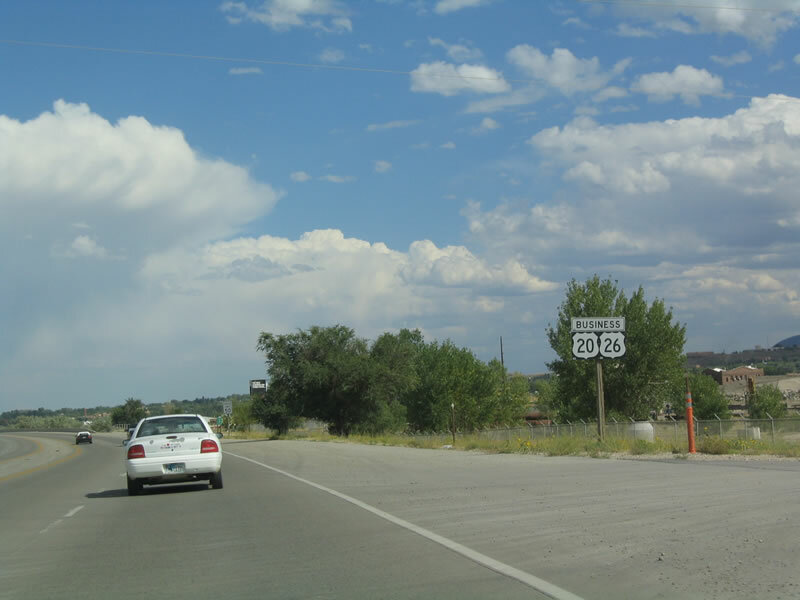 Use Wyoming 258 south to connect to several Wyoming state routes, including Wyoming 220, which follows the Historic Oregon Trail en route to three major reservoirs along the North Platte River (Alcova, Pathfinder, and Seminoe), Devils Gate, Independence Rock, and Muddy Gap (U.S. 287). 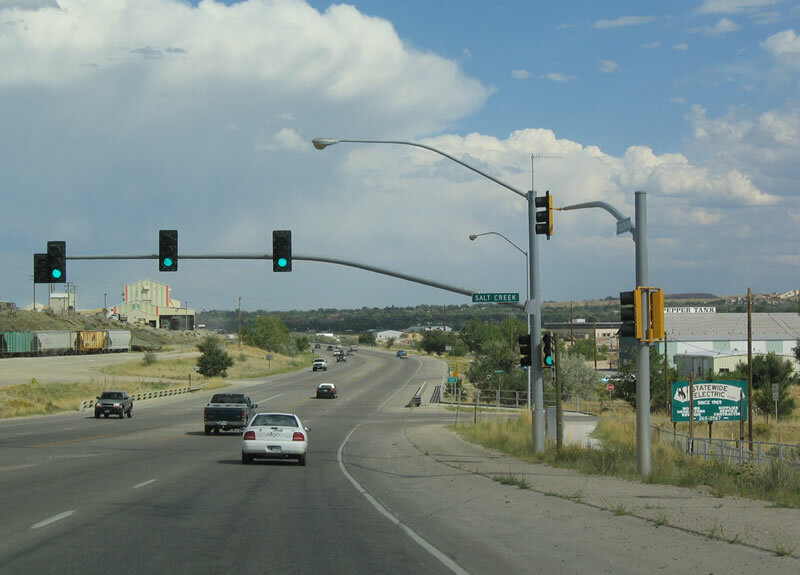 Two other state routes (Wyoming 251/Casper Mountain Road and Wyoming 252/Poplar Street) connect to destinations on or near Casper Mountain. Photo taken by 09/01/04. 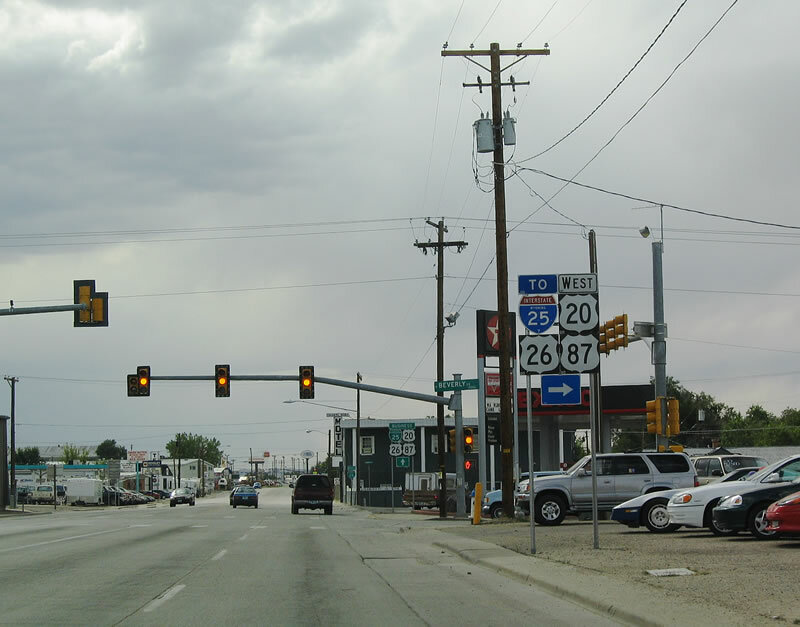 A simplified sign shows that Business U.S. 20-26 continues east to Casper, while Wyoming 258/Wyoming Boulevard travels south to Wyoming 220 en route to Rawlins. A left turn at this intersection connects to Hudson Street. Photo taken by 09/01/04. This is the second reassurance shield assembly, found immediately after the junction with Wyoming 258. 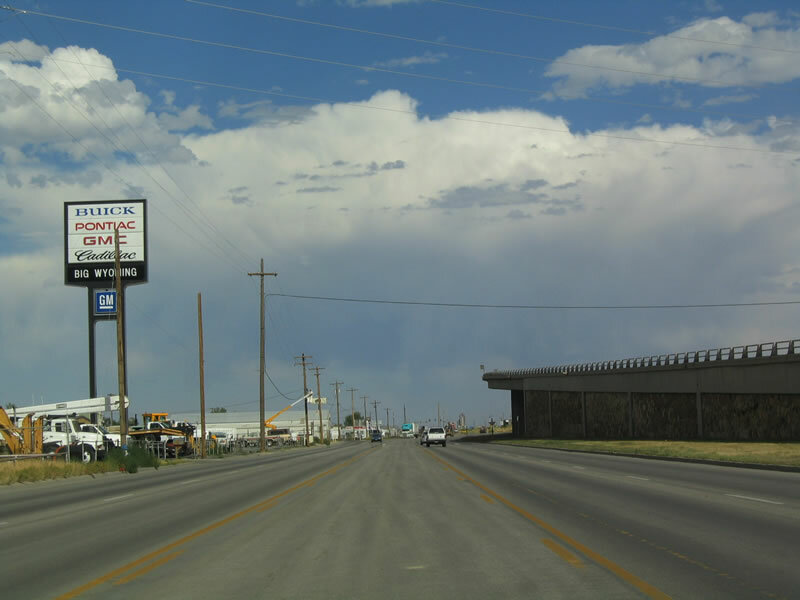 Unique to Wyoming is the oversized "Business" banner that spans across two route shields. Photo taken by 09/01/04. With the Burlington Northern and Santa Fe Railroad tracks as a backdrop, eastbound Business U.S. 20-26 meets Wyoming 254 (Salt Creek Highway). Wyoming 254 is the old alignment of U.S. 87. 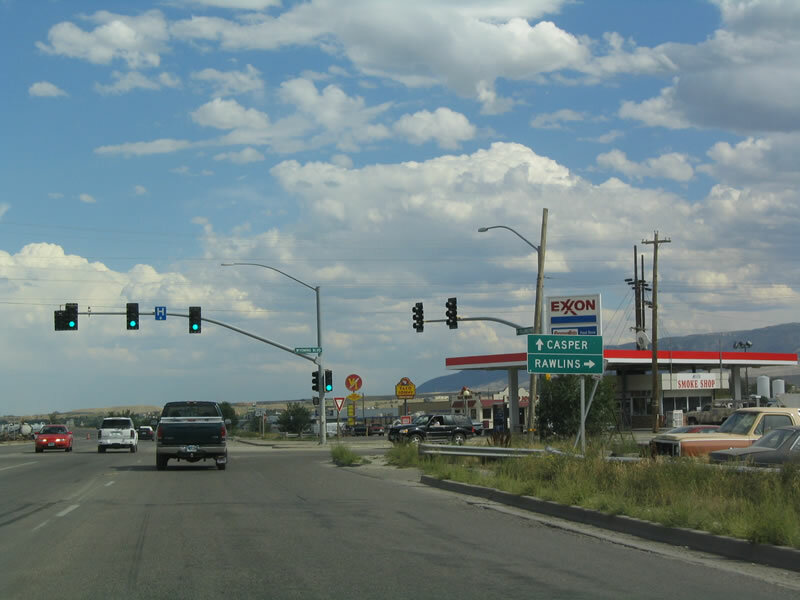 With U.S. 87 relocated onto Interstate 25, the old route is now a secondary state highway. 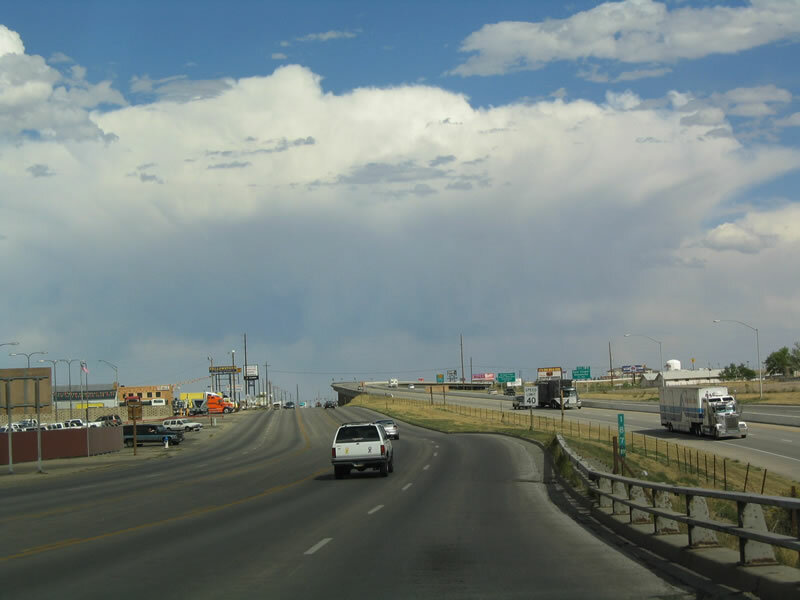 Wyoming 254 joins Interstate 25/U.S. 87 at Exit 191 near Bar Nunn. 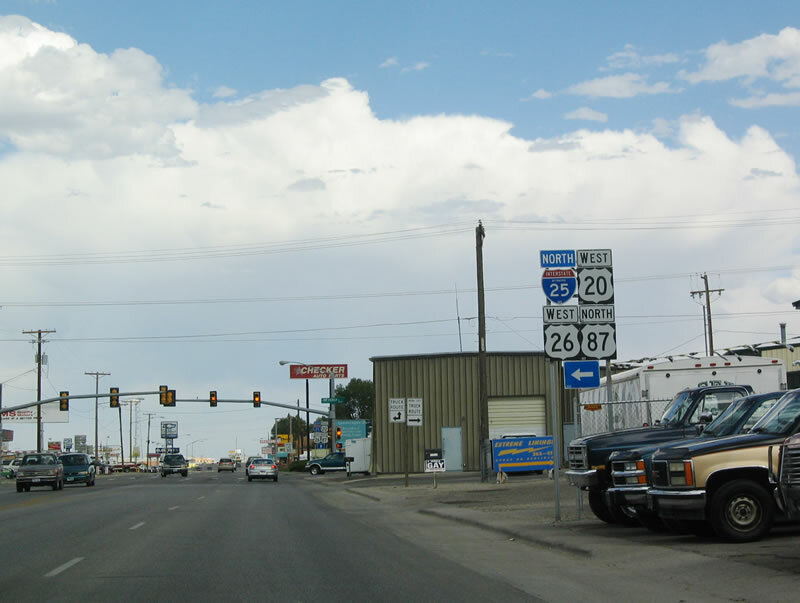 Since Business Loop I-25 follows a rather short alignment through Casper, Wyoming 254 is not part of the Interstate Business Loop. However, it would make sense for Business Loop I-25 to follow Wyoming 254 and then turn east through Mills and thence into Casper. Photo taken by 09/01/04. Another reassurance shield assembly is posted on eastbound after the Wyoming 254 junction. 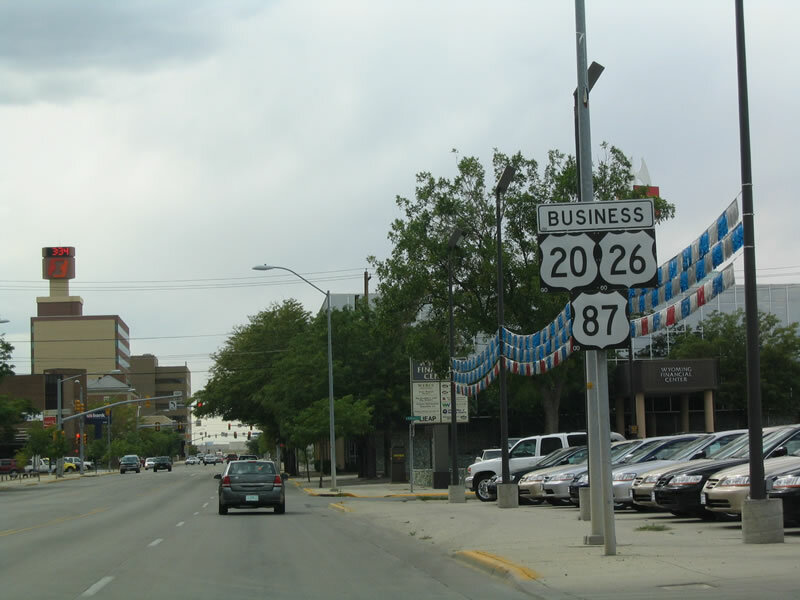 Between Wyoming 254 and just east of Wyoming 220, Business U.S. 20-26 follows the north bank of the North Platte River. The river is blocked off with a chain link fence, and no parking is allowed on the side of the road to see the river, even though it is very close to the highway. For a better view of the river, visit the Platte River Parkway, Crossroads Park, or North Casper Park. To Crossroads Park, turn north on Wyoming 220 (Poplar Street) and pass under Interstate 25. For North Casper Park, continue east on Business U.S. 20-26 to Business Loop I-25/Business U.S. 87/Wyoming 255 (Center Street) north. After passing under Interstate 25, turn east on K Street to North Casper Park. Photo taken by 09/01/04. The greenbelt formed by the North Platte River comes into view as Business U.S. 20-26 continues east toward Casper. A major tributary of the Missouri River, the North Platte River originates in the Mount Zirkel Wilderness in Colorado northwest of Walden (Colorado 14 and Colorado 125). The river travels north into Wyoming, passing by Encampment, Saratoga, and a series of reservoirs (Seminoe, Pathfinder, Alcova) before entering Casper. A wide river, the North Platte is generally not navigable except in the reservoirs or via canoe or inner tube. Continuing to the east, the North Platte River turns southeast at Douglas, passes through Glendo Reservoir, then aims toward Nebraska along a route roughly parallel to the Oregon Trail. The North Platte merges with the South Platte at the city of North Platte, Nebraska. The Platte River then continues east toward Omaha, and it merges with the Missouri River at a point south of that city. Photo taken by 09/01/04. 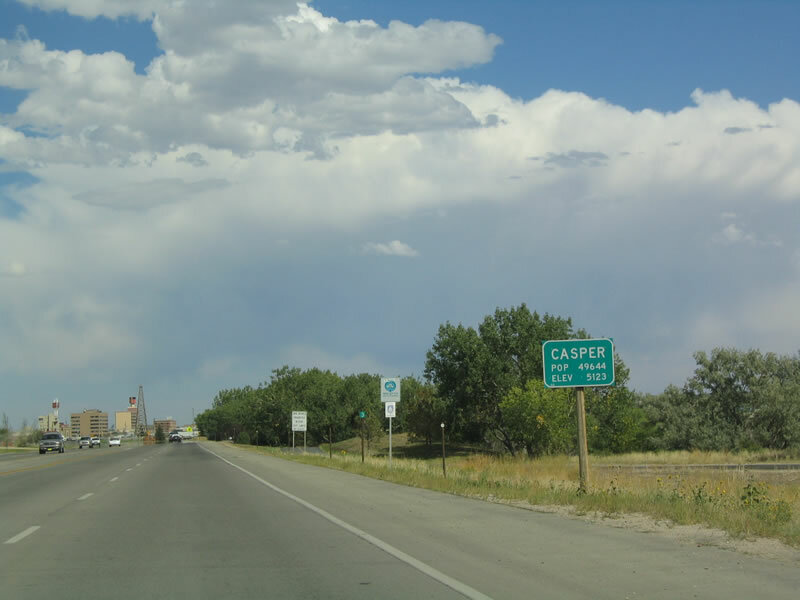 The city of Casper is home to 49,644 people (per the 2000 Census). 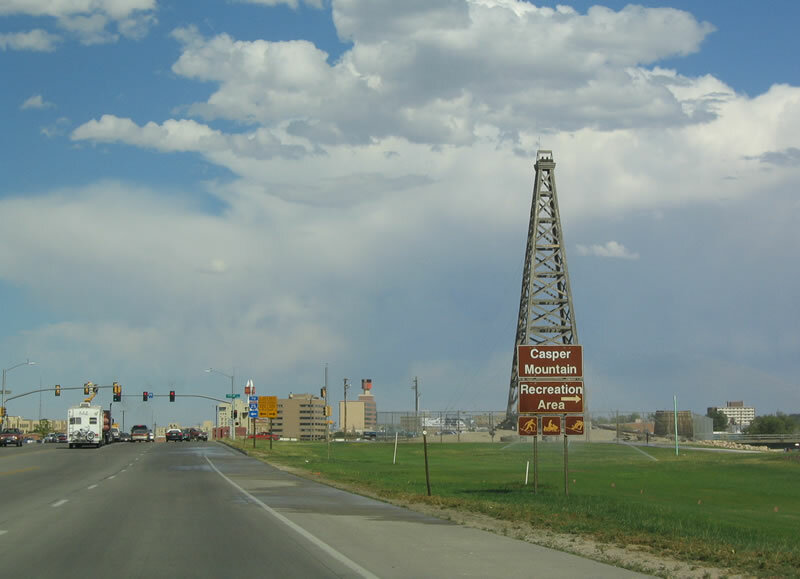 The second largest city in Wyoming, Casper was at one time the largest city in the Equality State. A variety of industries, including the state's largest newspaper (the Casper Star-Tribune), television programming (ABC affiliate K2 TV), Casper College (a two-year school that is trying to become the state's second four-year university), tourism, and mining activities including coal and oil. Uranium may be making a comeback as the Gas Hills west of Casper are rich with this energy laden material. Photo taken by 09/01/04. 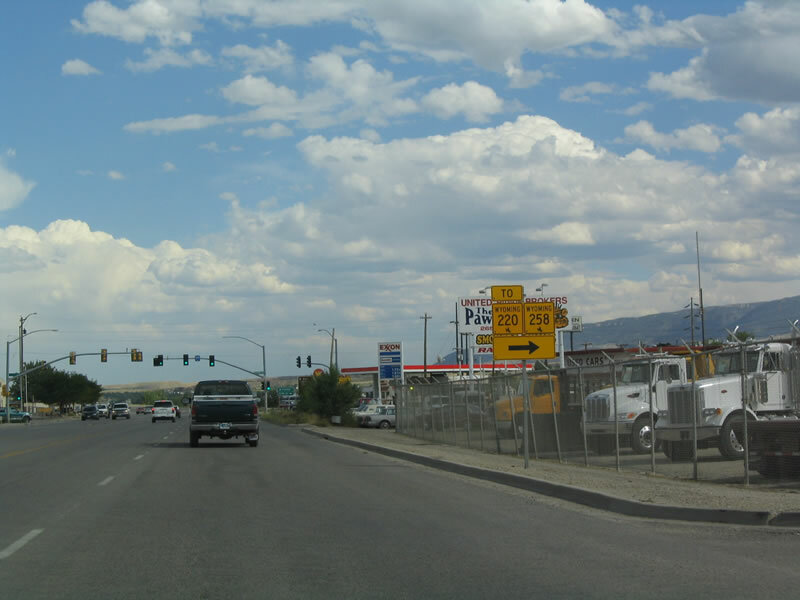 Eastbound Business U.S. 20-26 approaches Wyoming 220 (Poplar Street). 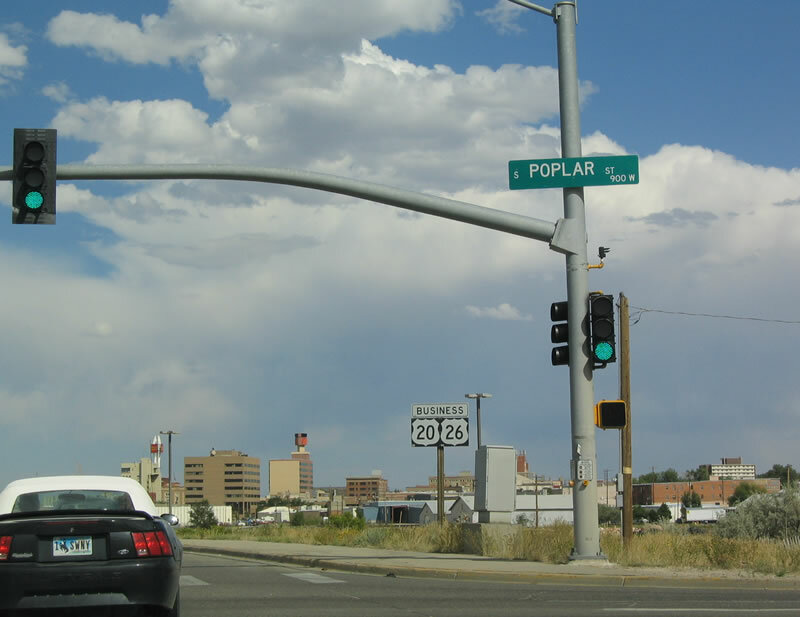 Follow Poplar Street north to Interstate 25 and U.S. 20-26-87 to bypass the downtown area; follow Poplar Street south to follow Wyoming 220 to join CY Avenue southwest toward Laramie (via Wyoming 487) and Rawlins (via U.S. 287/Wyoming 789). Photo taken by 09/01/04. An oil derrick rests in the Platte River Parkway greenbelt on the south side of Business U.S. 20-26. The greenbelt sits between the business route and the North Platte River. To the south, Wyoming 220 connects with Wyoming 252, which travels south to Casper Mountain and Hogadon Ski Area. Skiing is popular in the winter, and Hogadon represents one of a few resorts in Wyoming that are located outside of the Jackson Hole area. Wintertime highs in Casper only reach an average high of 32.8 degrees in January, which is only slightly above a freezing temperature. However, Casper warms well into the 80s on average in the summer (July and August). Photo taken by 09/01/04. 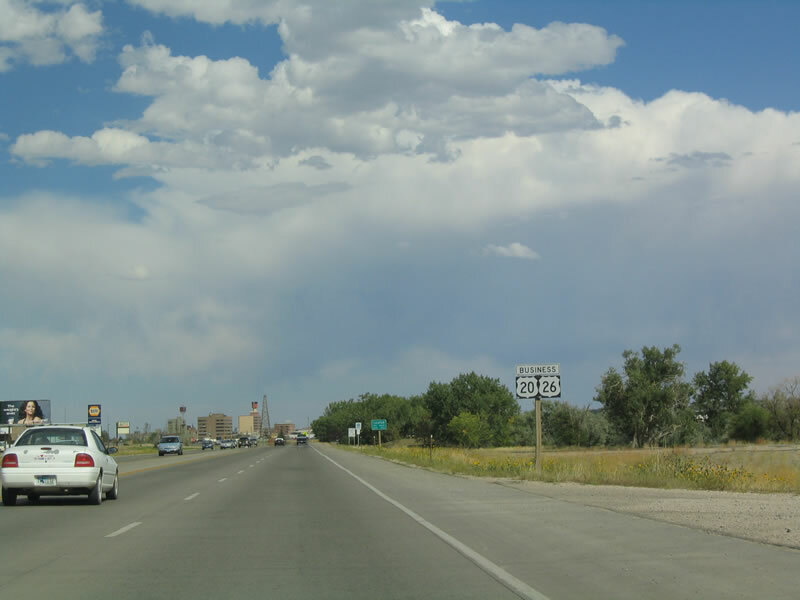 To Interstate 25, follow Wyoming 220 northeast. To Wyoming 252 and Wyoming 487, follow Wyoming 220 southwest. 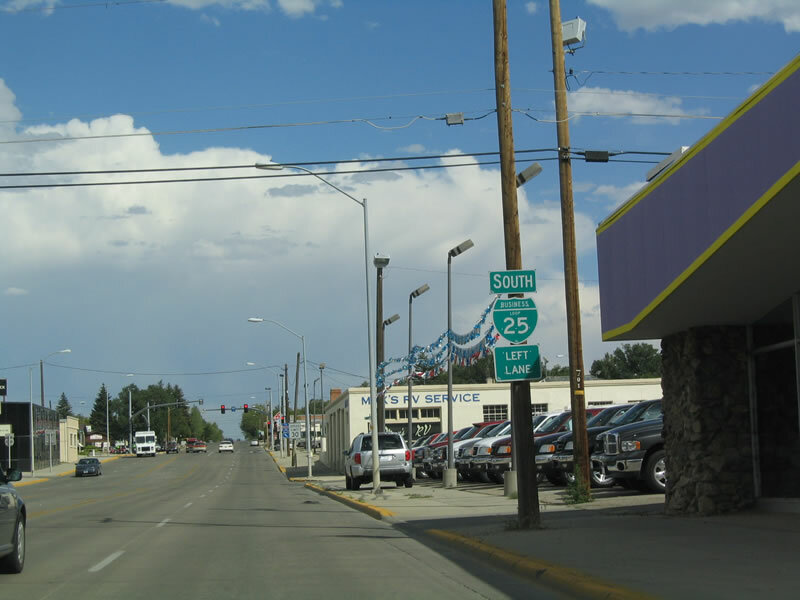 Business U.S. 20-26 continues east along Yellowstone Highway toward downtown Casper. Photo taken by 09/01/04. Eastbound Business U.S. 20-26 meets Wyoming 220 at Poplar Street. To Casper College and Mike Sedar Park, follow Poplar Street past CY Avenue (where Wyoming 220 branches west and Wyoming 252 continues south). Wyoming 252 eventually merges with Wyoming 251/Casper Mountain Road just north of Hogadon Ski Area. 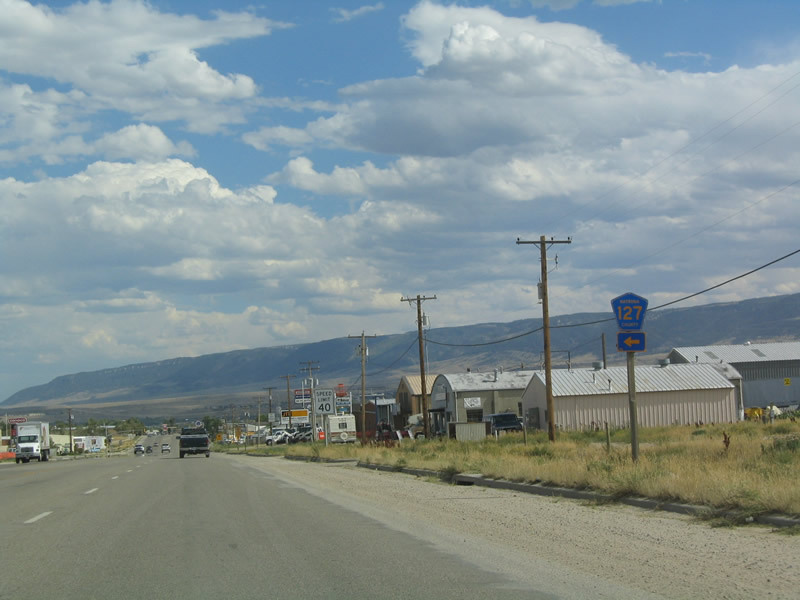 Wyoming 220 was designated as U.S. 87E between 1926 and 1938 (even though U.S. 87W was eliminated in 1936, U.S. 87E remained in place between Muddy Gap and Casper for another couple of years). Photo taken by 09/01/04. Finally crossing the North Platte River, Business U.S. 20-26 prepares to enter downtown Casper. The highway retains four lanes as it crosses over the bridge. For more information on the river, visit North Platte River Parkway official site. This site shows walkways and trails adjacent to the North Platte River in Casper. Photo taken by 09/01/04. 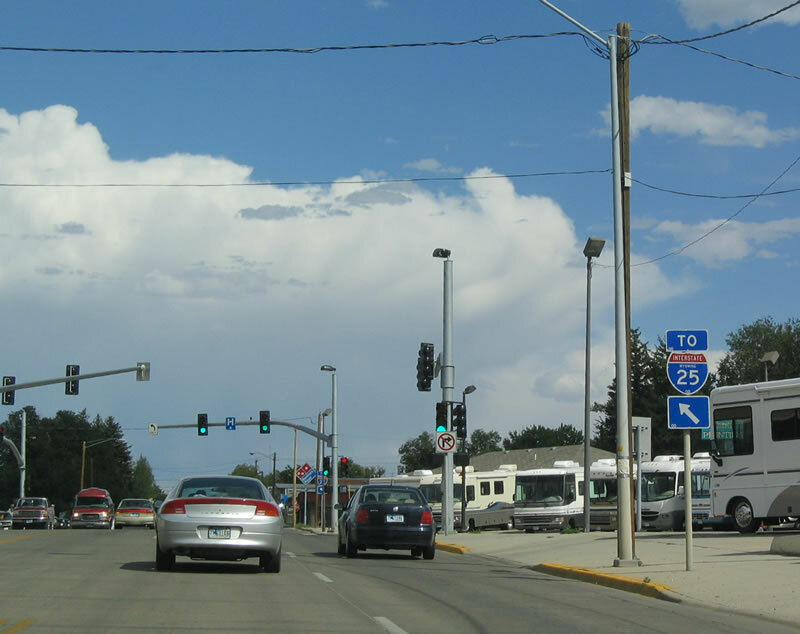 After the North Platte River bridge, downtown Casper lays out for eastbound travelers. 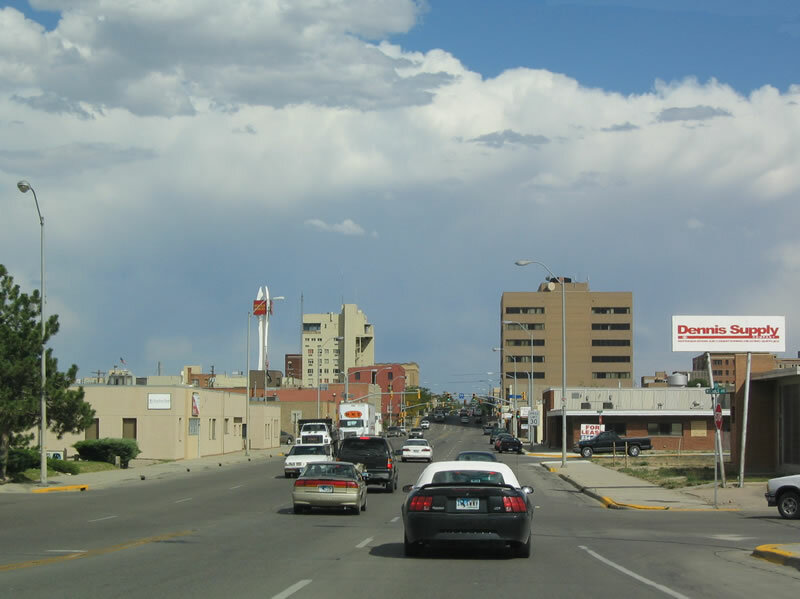 The skyline includes several mid-rise buildings that are tall for any Wyoming city. 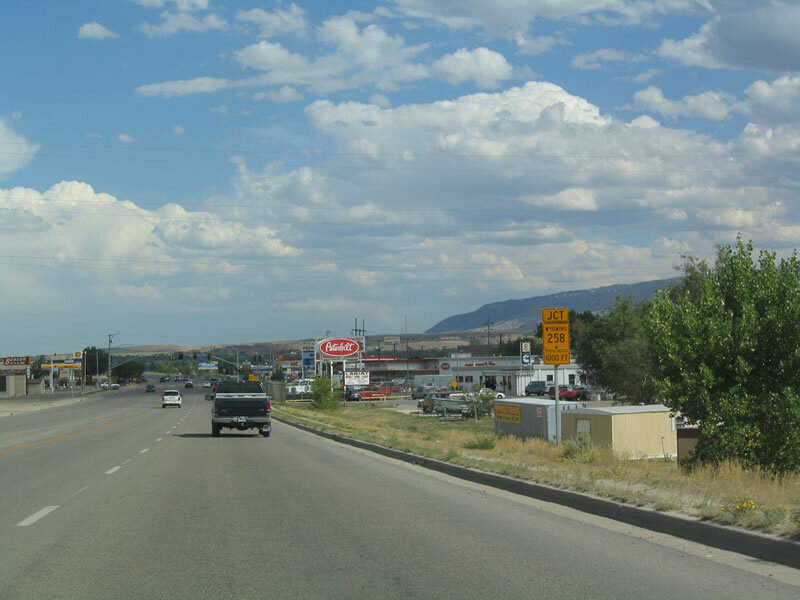 The city of Casper is a major tourist destination for travelers en route to Yellowstone-Grand Teton National Parks, motorists on Interstate 25, and visitors following the historic trails that converge on the city. Settled in the 1800s due to its location on the North Platte River, Casper has always had a historical significance during the taming of the Western Frontier. In addition, no fewer than five major east-west trails -- Bozeman Trail, Bridger Trail, Mormon Trail, Oregon Trail, and Pony Express Trail -- passed through Casper at various points in history. Photo taken by 09/01/04. 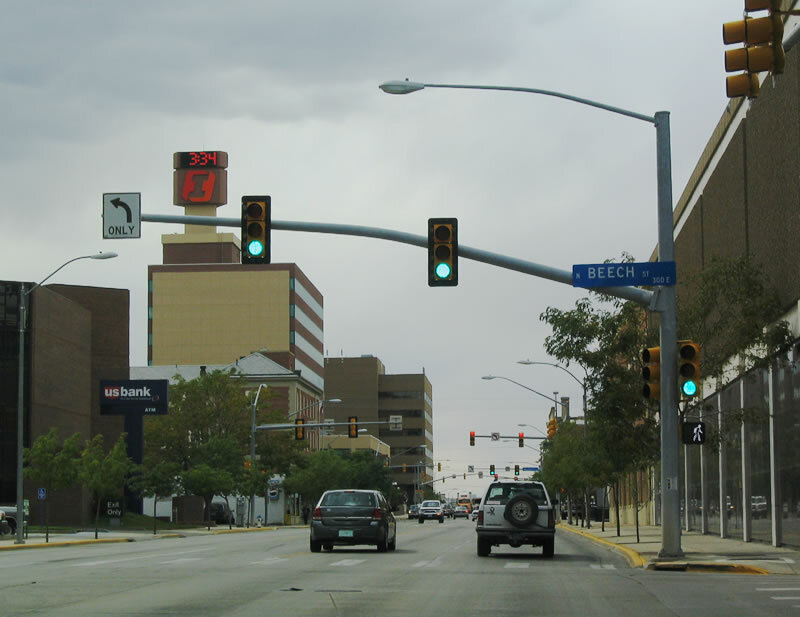 As part of an urban renewal program, the city of Casper is in the process of redeveloping downtown Casper with funding from the optional one-cent sales tax. 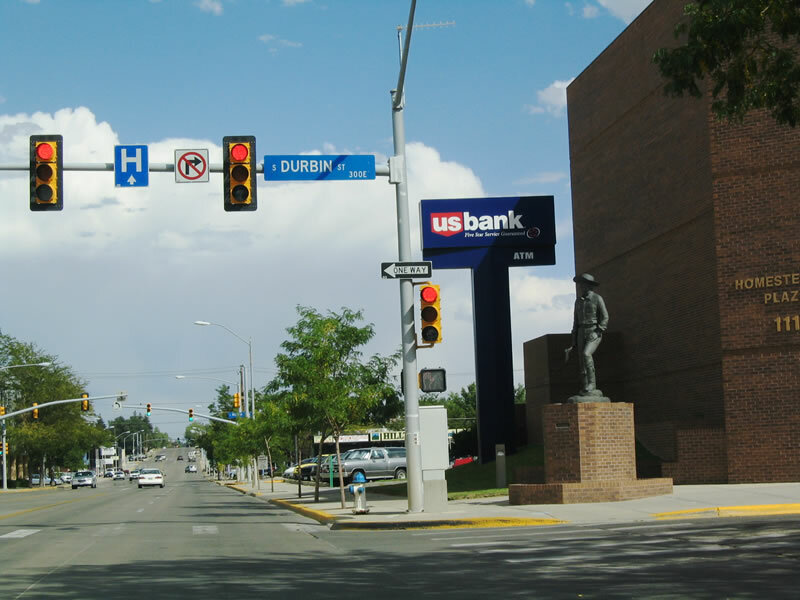 Called Downtown Casper Reconstruction and Improvement Project (DROC), the improvements include replacement light fixtures, serpentine sidewalks, parkway landscaping, pavers, and street furniture. Photo taken by 09/01/04. 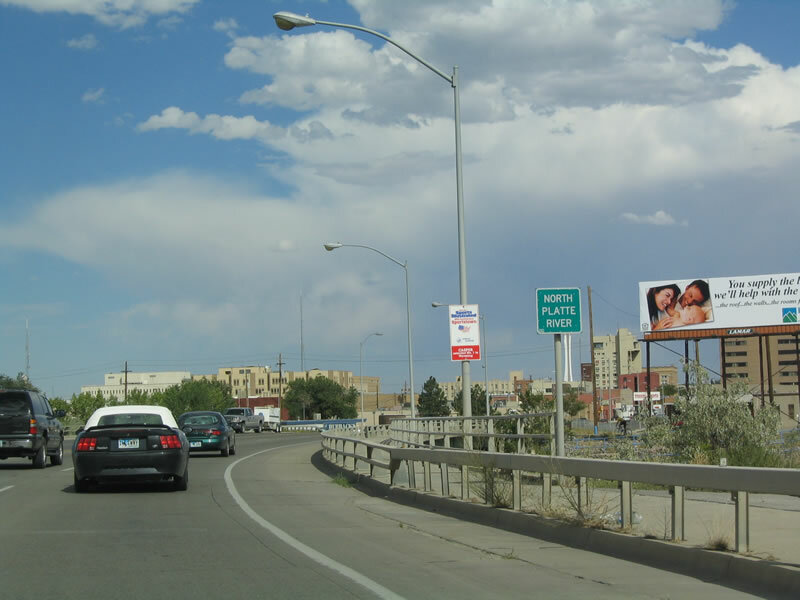 Now approaching Center Street, this sign assembly shows that Business Loop I-25 joins together with Business U.S. 20-26. 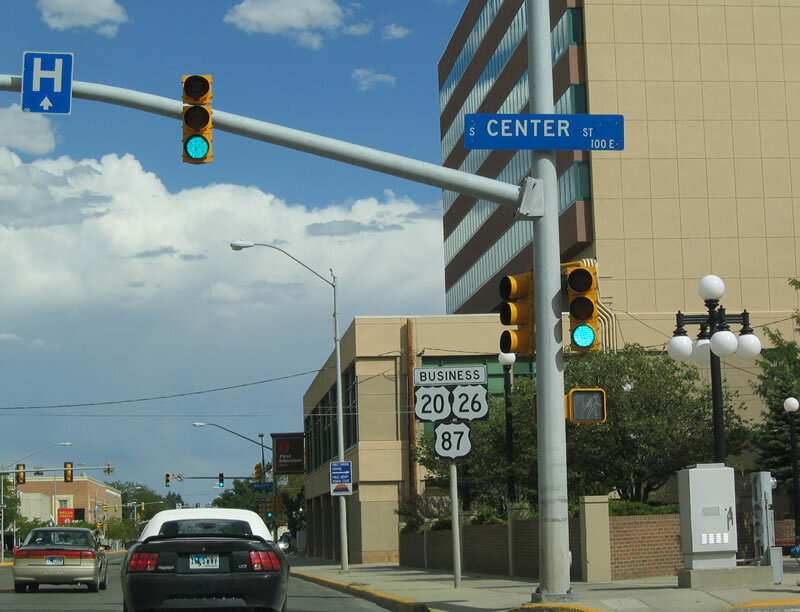 To Interstate 25, follow Center Street north; the business loop (and Business U.S. 87) merges onto eastbound Business U.S. 20-26. Photo taken by 09/01/04. Eastbound Business U.S. 20-26 meets Business Loop I-25/Business U.S. 87 at Center Street in downtown Casper. The first reassurance shield shows the three business U.S. routes, but it omits the green business loop shield. Photo taken by 09/01/04. Continuing east, Business Loop I-25 south and Business U.S. 20-26-87 encounter Durbin Street. A statue of a pioneer appears in Homestead Plaza next to a U.S. Bank branch. Photo taken by 09/01/04. Another Business U.S. 20-26-87 shield assembly is found on eastbound First Street. Again, Business Loop I-25 is not signed. Photo taken by 09/01/04. And yet, Business Loop I-25 reappears only a block east of the shields posted in the previous photobox. All four business routes -- Business Loop I-25 and Business U.S. 20-26-87 -- turn east onto Yellowstone Highway; First Street continues straight ahead as a local city street. Photo taken by 09/01/04. To Interstate 25, follow southbound Business Loop I-25/Business U.S. 87 and eastbound Business U.S. 20-26 along Yellowstone Highway. Note that the business route is heading northeast, even though signed as southbound. Photo taken by 09/01/04. Business Loop I-25 is now signed as To Interstate 25. Now Business U.S. 20-26-87 are not signed here either. The business route is now traveling northwest toward a rendezvous with Interstate 25 at Exit 168. Photo taken by 09/01/04. Now approaching McKinley Street, Business U.S. 20-26-87 is again signed, but the Business Loop I-25 shield is missing. Photo taken by 09/01/04. Another set of business route shields is posted along Yellowstone Highway as the business route passes between McKinley Street and Beverly Street. Photo taken by 09/01/04. An Interstate 25 trailblazer shield is posted here just prior to Beverly Street. Photo taken by 09/01/04. 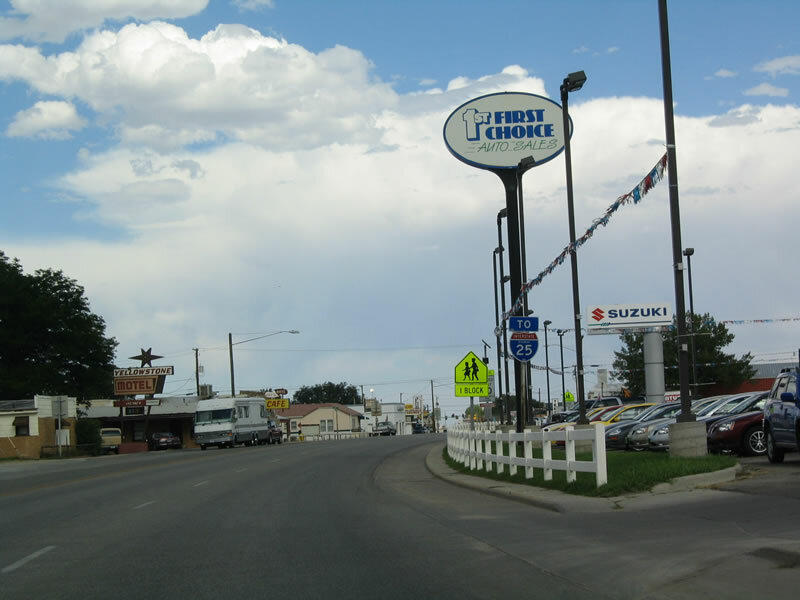 This section of the Yellowstone Highway is light industrial and commercial, with a variety of vendors line the street. Photo taken by 09/01/04. To return to north Interstate 25/U.S. 87 and U.S. 20-26 west , turn left from Yellowstone Highway onto northbound Beverly Street. You can connect to northbound Interstate 25 by continuing straight on Yellowstone Highway, but that route is far less direct. 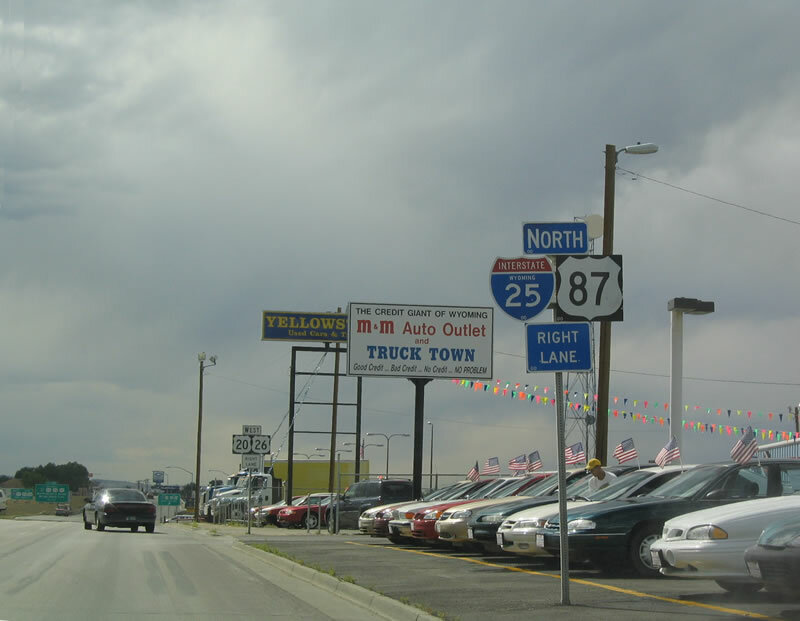 Interstate 25 and U.S. 87 travel north to Buffalo; U.S. 87 continues from there and passes Sheridan before entering the Treasure State of Montana. Photo taken by 09/01/04. Continue straight ahead along Yellowstone Highway to return to south Interstate 25/U.S. 87 and east U.S. 20-26. Yellowstone Highway carries U.S. 20-26-87 parallel to the North Platte River and Burlington Northern and Santa Fe Railroad between Casper and Glenrock. Photo taken by 09/01/04. 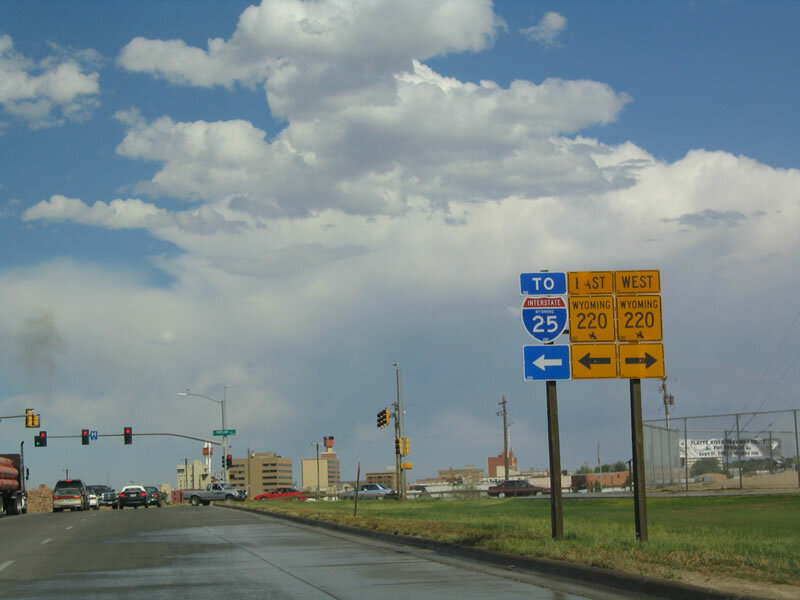 Eastbound Business Loop I-25 and Business U.S. 20-26-87 reaches its junction with Interstate 25 and U.S. 20-26-87. Follow Interstate 25 southeast to Douglas and Cheyenne. 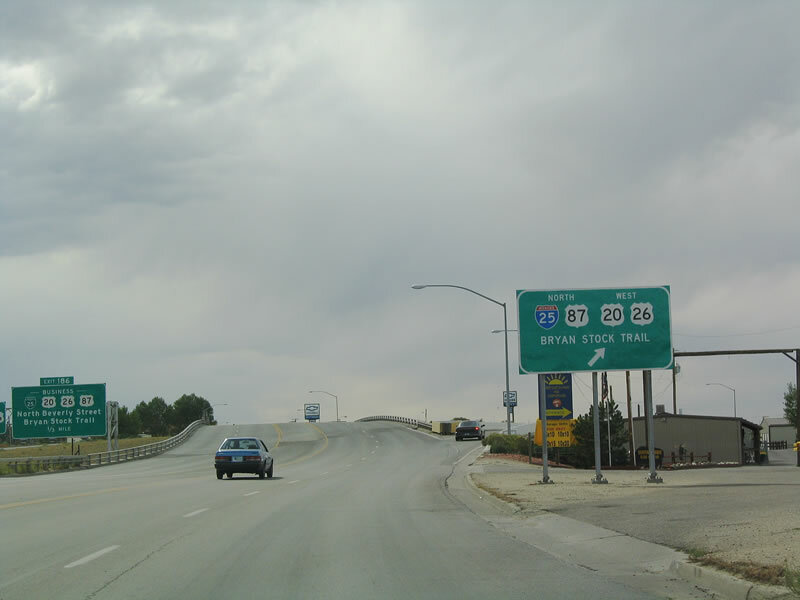 While the three U.S. routes remain on their original alignment between this interchange and Glenrock, they all rejoin Interstate 25 at Exit 160. After passing through Douglas, U.S. 20 splits off the freeway at Exit 126, Orin Junction. U.S. 26 follows the Oregon Trail by exiting the freeway at a tri-level stack interchange at Exit 92. 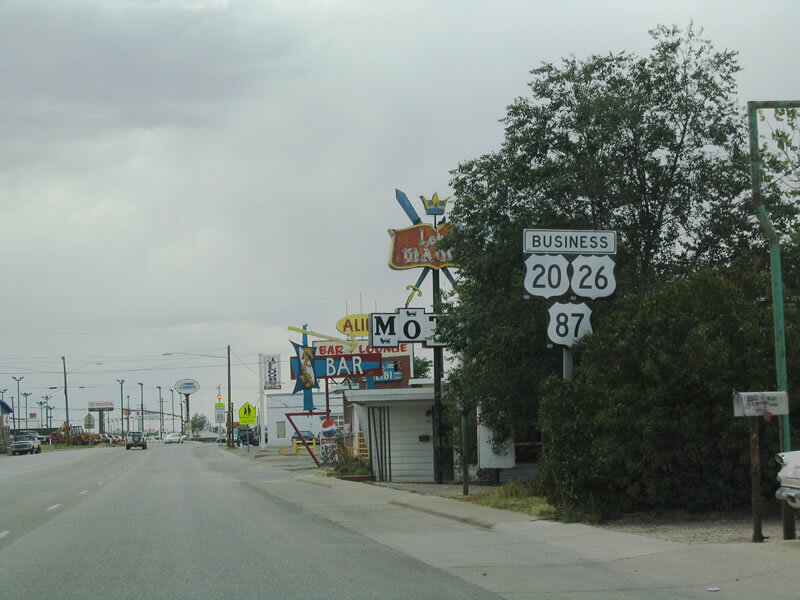 U.S. 87, of course, stays with Interstate 25 until reaching Raton, New Mexico. Photo taken by 09/01/04. 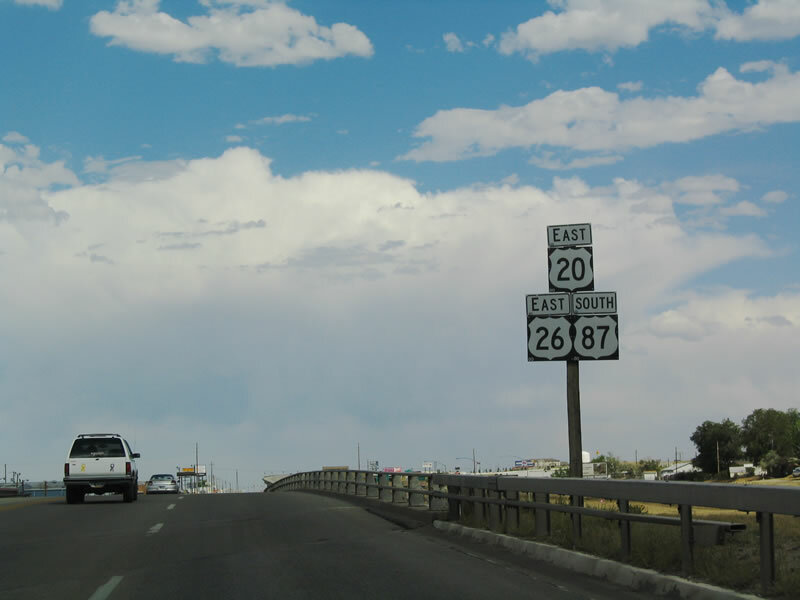 Upon crossing over Interstate 25, U.S. 20-26-87 are signed together as an independent route. The highway expands into a four-lane expressway, and it is possible that this route was considered as a possible route for Interstate 25 before the construction of Interstate 25 on its current alignment. Photo taken by 09/01/04. Interstate 25 lays alongside U.S. 20-26-87 as the U.S. highway travels east toward Glenrock. 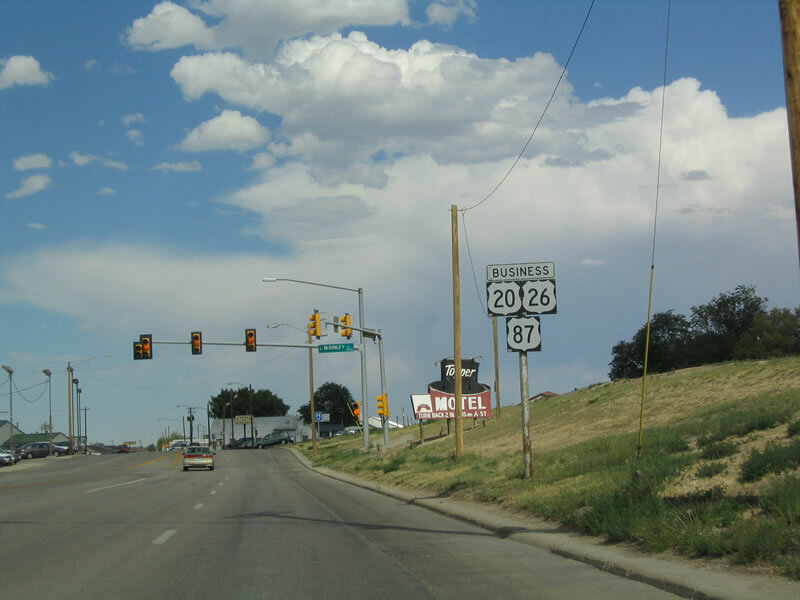 While Interstate 25 may be the faster route to Glenrock due to higher speed limits, U.S. 20-26-87 is the more direct route to Glenrock. Photo taken by 09/01/04. Car dealerships as well as industrial and equipment rentals line this stretch of U.S. 20-26-87 as the route slips away from the Interstate and its towering ramp. Photo taken by 09/01/04. 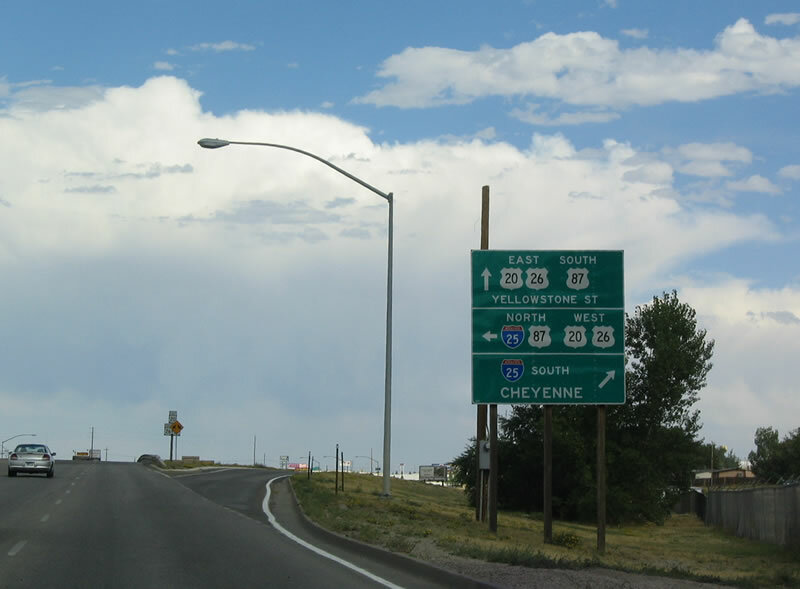 Northbound U.S. 87 and westbound U.S. 20-26 (Yellowstone Highway) approaches Interstate 25 north of Evansville and east of Casper. 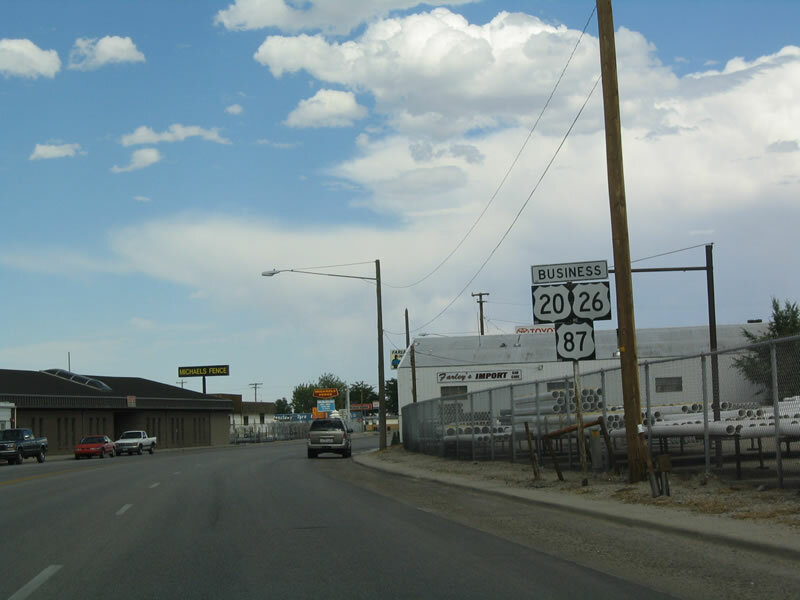 The extant section of U.S. 20-26-87 between Glenrock and Casper comes to an end here; the through route yields to a business route, and U.S. 20-26-87 transitions onto the freeway. Photo taken by 09/01/04. To U.S. 20-26 west, stay in the right lane. To Business U.S. 20-26 west, stay in the left lane. Photo taken by 09/01/04. 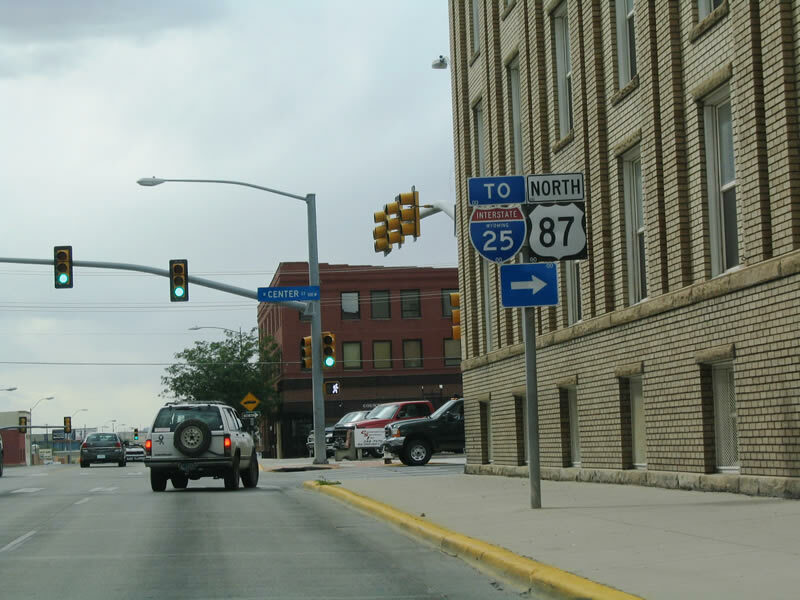 The mainline of U.S. 20-26-87 exits Yellowstone Highway and follows Interstate 25 northwest past downtown Casper. Although not signed here, Business U.S. 20-26-87 travel west from here toward downtown. Note that Business Loop I-25 has not yet joined the business route into Casper. Photo taken by 09/01/04. This is the first reassurance shield for westbound U.S. 20-26-87 along Yellowstone Highway. Now that the business route is south of Interstate 25, it moves away from the North Plate River corridor. Photo taken by 09/01/04. 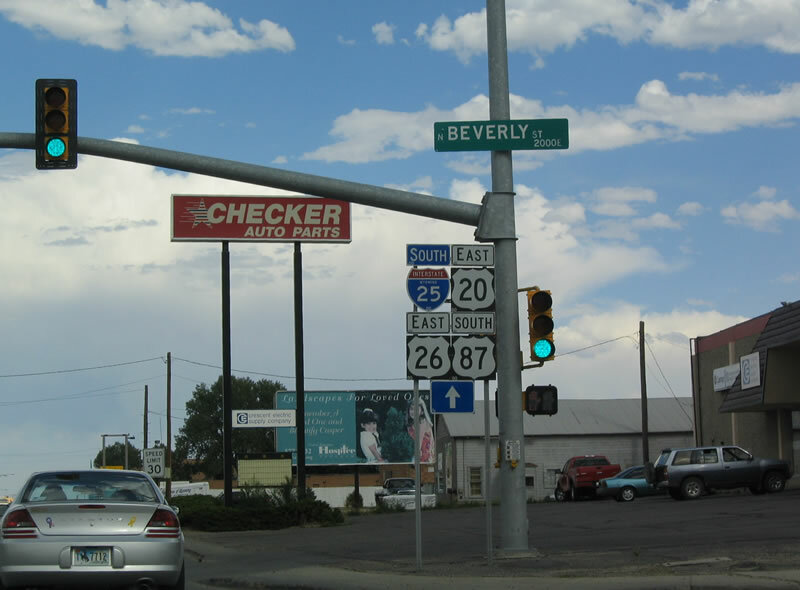 Turn right at Beverly Street to return to Interstate 25. 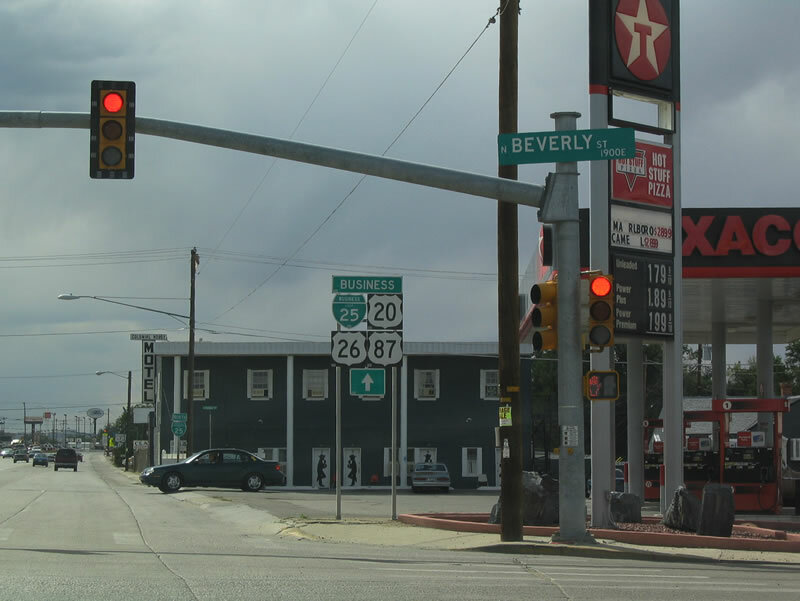 Beverly Street is not signed as a state route on the northbound side, but it is signed as "Business Loop I-25 north" on its southbound side. This is due to the lack of direct connection ramps from northbound Interstate 25 to westbound Yellowstone Highway until the Beverly Street junction. Photo taken by 09/01/04. Continue straight ahead along Yellowstone Highway to follow Business Loop I-25 and Business U.S. 20-26-87 toward downtown Casper. Photo taken by 09/01/04. Near the Colonial House Motel is this Business Loop I-25 reassurance shield along westbound Yellowstone Highway. Photo taken by 09/01/04. 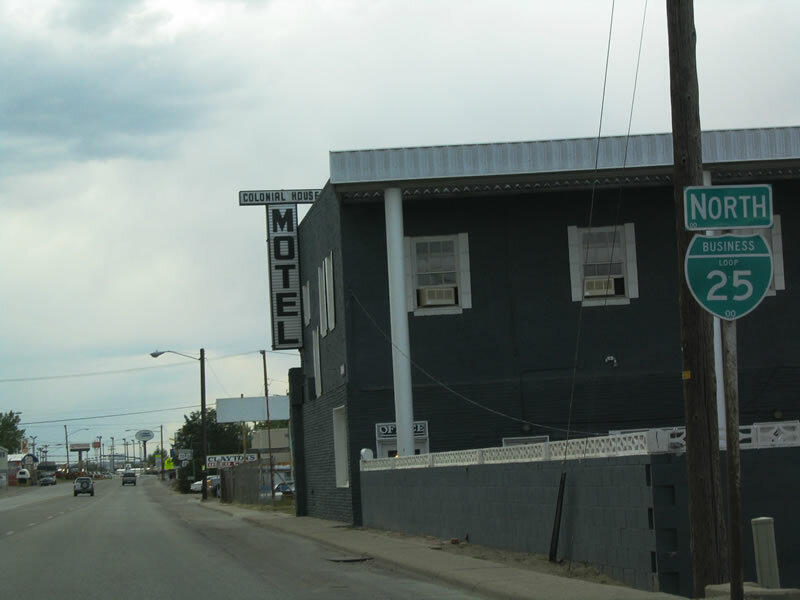 More motels are located along Yellowstone Highway (Business Loop I-25 and Business U.S. 20-26-87) after Beverly Street. Photo taken by 09/01/04. 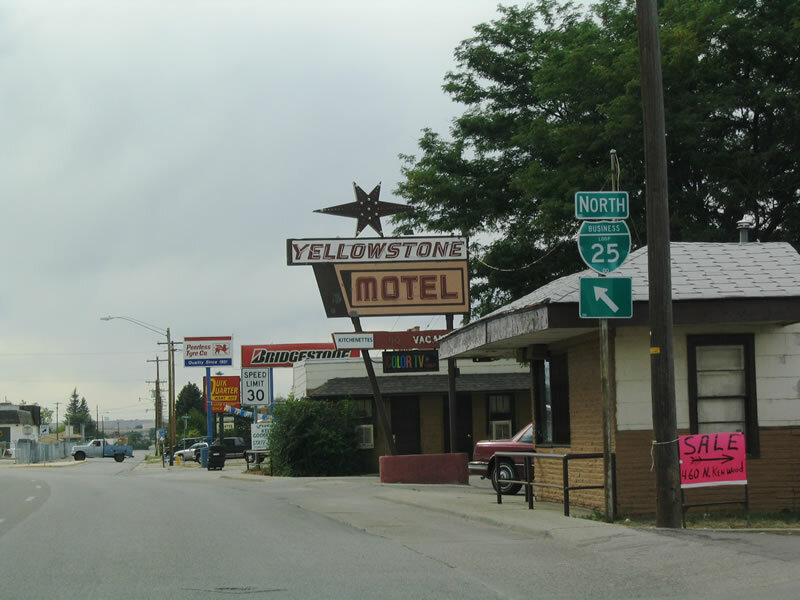 The Yellowstone Motel is located off of Yellowstone Highway in east Casper. Photo taken by 09/01/04. 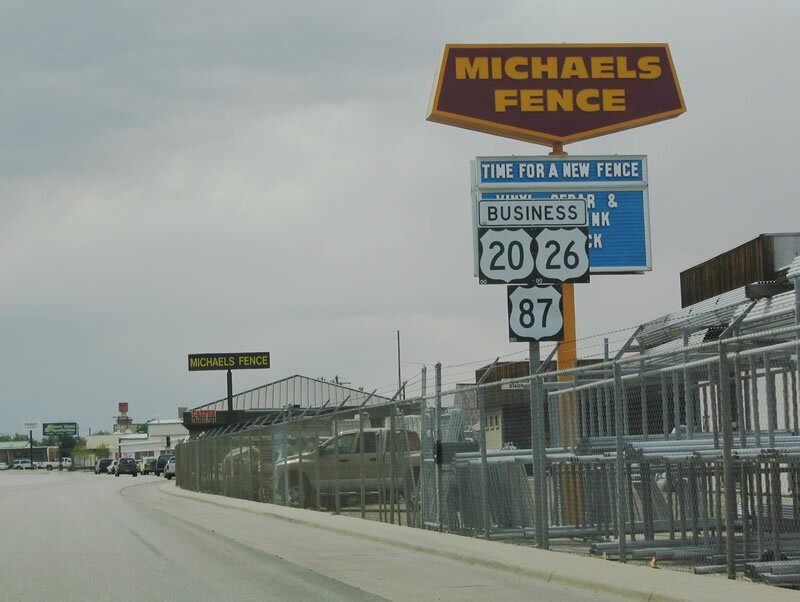 Business U.S. 20-26-87 is signed as the business route passes by a fence supplier. Photo taken by 09/01/04. 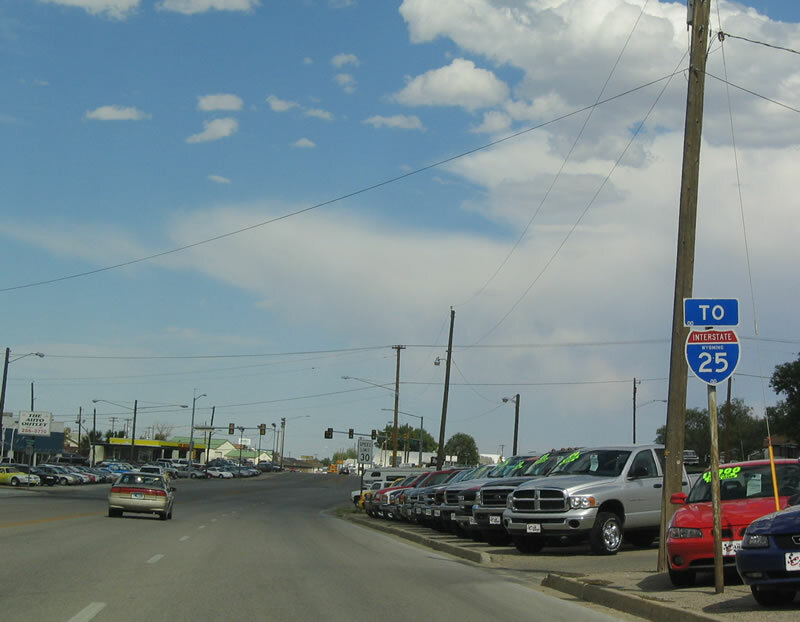 At First Street, Business Loop I-25 and Business U.S. 20-26-87 turns west toward downtown Casper. Photo taken by 09/01/04. 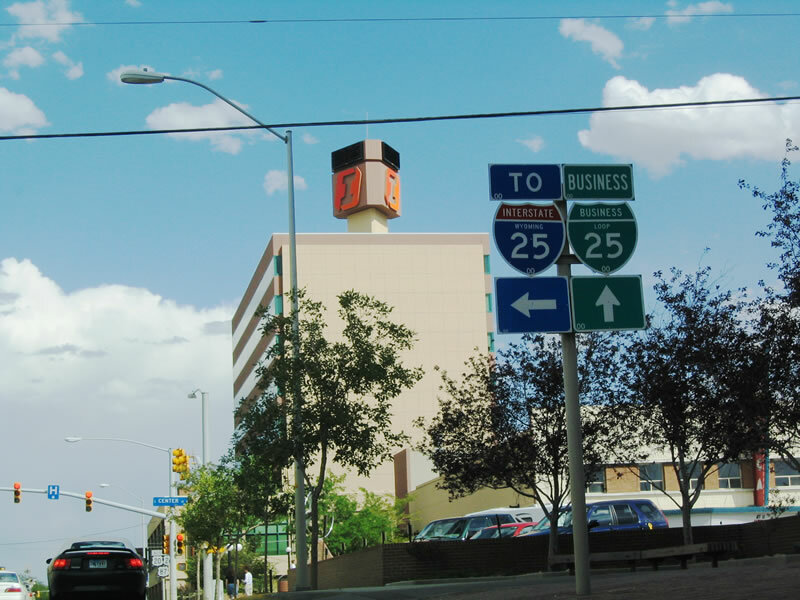 A few of the mid-rise towers come into view on westbound Business Loop I-25 and Business U.S. 20-26-87, including the First Interstate Bank. Photo taken by 09/01/04. 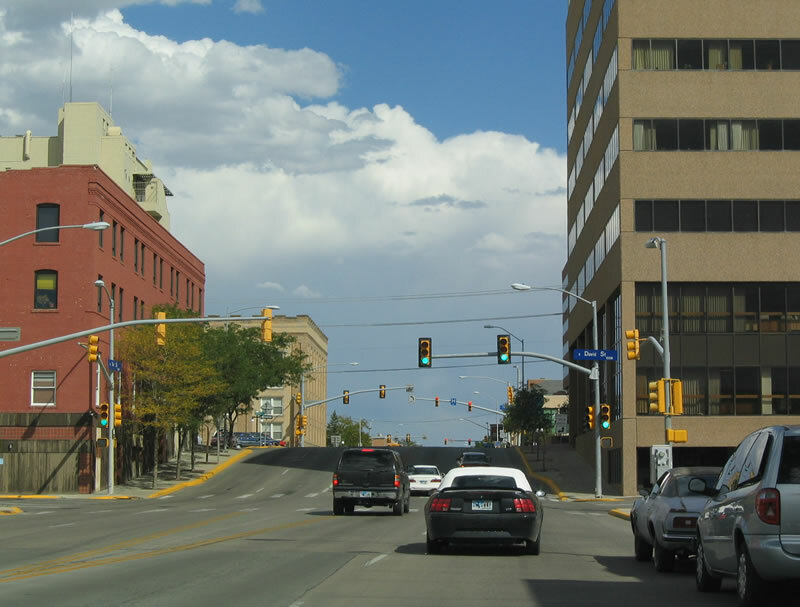 Passing by the Wyoming Financial Center to the right, First Street (Business Loop I-25/Business U.S. 20-26-87) continues west into downtown Casper. Photo taken by 09/01/04. Westbound Business Loop I-25 and Business U.S. 20-26-87 reaches Beech Street. Photo taken by 09/01/04. 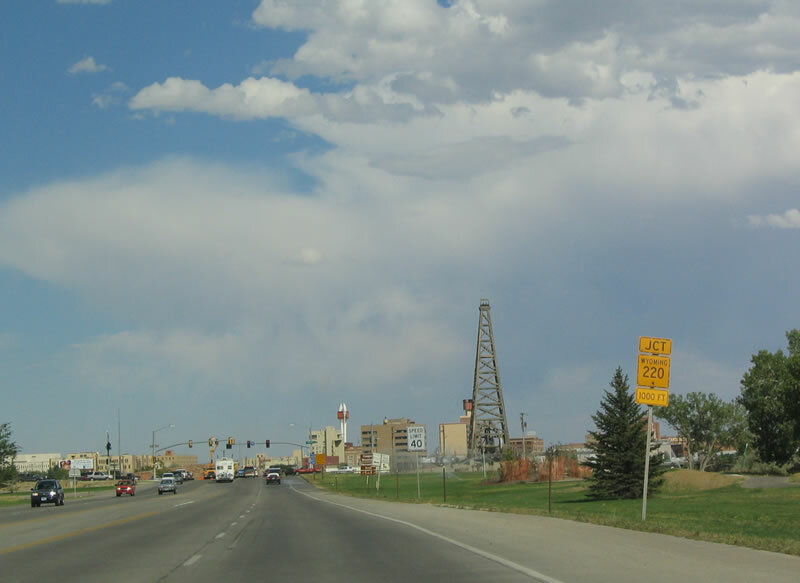 Business Loop I-25, Business U.S. 87 and unsigned Wyoming 255 travel north on Center Street from First Street/Yellowstone Highway. 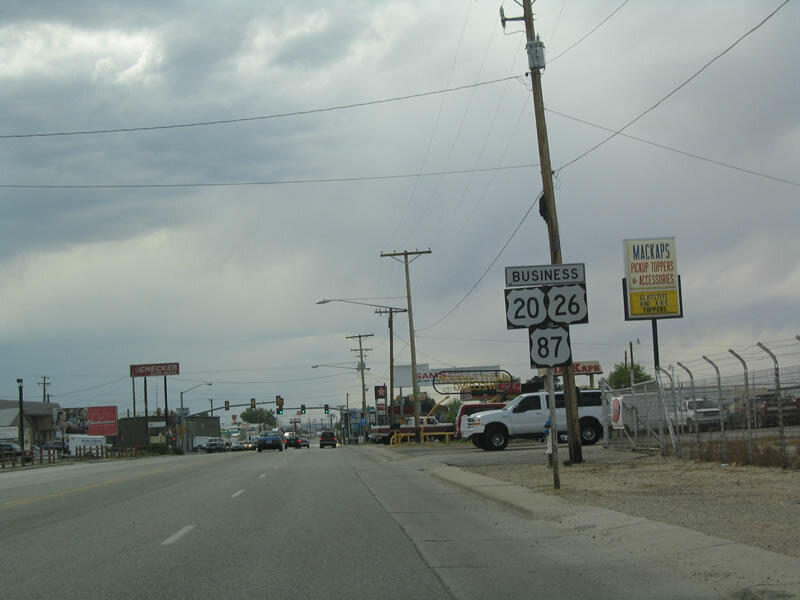 Business U.S. 20-26 continue west toward Mills and Casper International Airport. 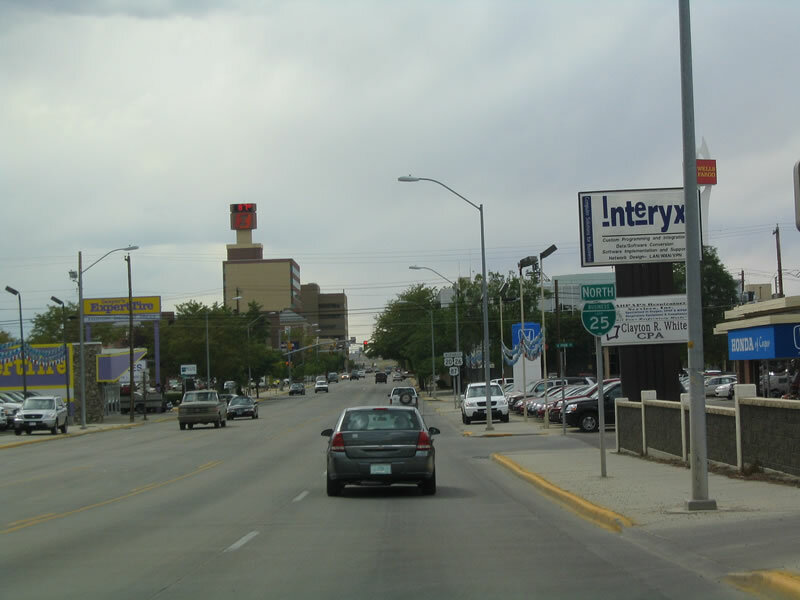 Interstate 25 travels east-west through downtown Casper, and the freeway is only a short distance north of here via Center Street. Photo taken by 09/01/04.